On Wednesday (June 20), the sun will arrive at its northernmost point in the sky and herald a season change on Earth, with summer officially beginning in the Northern Hemisphere, while the winter season kicks off in the Southern Hemisphere. The northern summer solstice will occur at 7:09 p.m. EDT (2309 GMT). Just as the word "armistice" is defined as a staying of the action of arms, "solstice" is a staying of the sun's apparent motion over the latitudes of the Earth. At the summer solstice, the sun stops its northward motion and begins heading south. At the winter solstice, it turns north. I’ll bet if you ask most people in which month of the year they believe Earth is closest to the sun most probably would say we’re closest during June, July or August. But our warm weather doesn’t relate to our distance from the sun. It’s actually because of the 23.5-degree tilt of the Earth’s axis that the sun is above the horizon for different lengths of time at different seasons. Heat received by any region is dependent on the length of daylight and the angle of the sun above the horizon. Hence the noticeable differences in temperatures that are registered over different parts of the world. If the sun's insolation, which is the total energy received from the sun, alone governed the temperature, then right now we should be experiencing the year’s hottest weather. But the atmosphere in temperate regions continues to receive more heat than it gives up to space, a situation that lasts about a month or more, depending on the latitude. A reverse process occurs after the winter solstice in December. So therefore that our hottest weather usually comes in late July and our coldest in late January. The solar heating depends directly on the sun's altitude in the sky, which also controls its daily path and the number of hours the sun is above the horizon. As a result, on April 12 the insolation is the same as on Aug. 31, but because of that seasonal temperature lag we can freeze at the former date, or have a 90-degree heat wave at the latter. Incidentally, on July 4 at 10 p.m. EDT (0200 July 5 GMT), Earth will reach that point in its orbit where it’s farthest from the sun in space. Called aphelion, the sun at that moment will be 94,505,849 miles away, or 3,103,882 miles farther as compared to when our Earth was closest to it (called perihelion) last Jan. 4. From the latitude of New York, you can never see the sun directly overhead, but on Wednesday at 12:57 p.m. EDT (1657 GMT), the sun will attain its highest point in the sky for this entire year, standing 73 degrees above the southern horizon. Since the sun will appear to describe such a high arc across the sky, the duration of daylight is now at its most extreme, lasting 15 hours and 4 minutes. Contrary to popular belief, the earliest sunrise and latest sunset do not coincide with the summer solstice. For temperate latitudes, he earliest sunrise actually occurred back on June 14, while the latest sunset is not due until June 27. Lastly, take note that technically, beginning at 7:10 p.m. EDT (2310 GMT) on Wednesday, the sun will have turned around and start moving back toward the south. 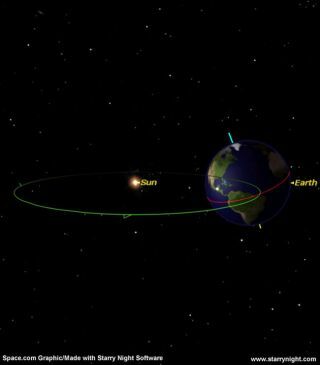 It will cross the equator at the autumnal equinox, passing into the Southern Hemisphere on Sept. 20, at 10:44 a.m. EDT (1444 GMT). You can actually watch the June solstice usher in summer in the Northern Hemisphere live online via the Slooh Space Camera, which will webcast a special live show on Wednesday (June 20) at 7 p.m. EDT (2300 GMT). Slooh officials say the event will look at recent solar weather events and mark the summer solstice.